To see videos of our expandable hopper in operation, scroll down this page. 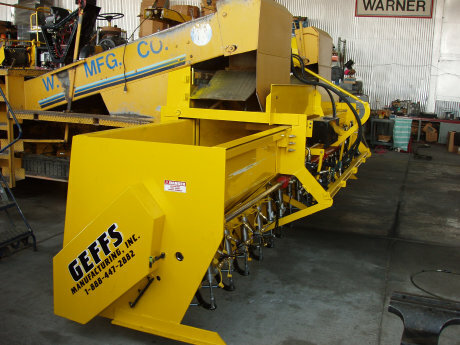 GEFFS MANUFACTURING, INC. CAN PROVIDE YOU WITH A NEW FACTORY INSTALLED EXPANDABLE HOPPER WITH OUR RATE AND GATE CONTROL SYSTEM. Our expandable hopper when closed is 10 ft 8 inches for travel and when fully expanded is 17 foot 6 inches giving you versatility for your road width. 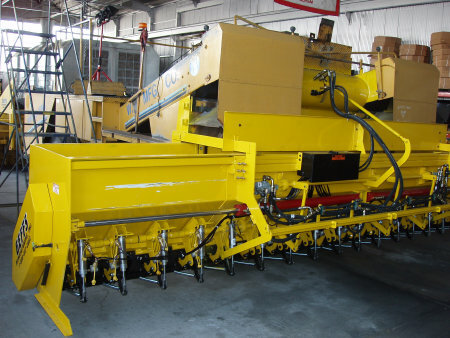 Each gate is equipped with an air cylinder for closing or opening your spread width on the fly. The gates are controlled hydraulically for rate of application of aggregate. Each gate has a rubber liner attached to reduce wear on your gates. Hydraulically driven agitator and augers provide movement of aggregate to the outer ends of the hopper when expanded. A hopper that has proven itself for almost 20 years. Visible display even in the brightest sunlight. Expandable hopper collapsed is only 10 ft 8 inches wide and you can chip spread from 12 inches to 120 inches while collapsed. Gates for extending are stored on rack above center section gates. 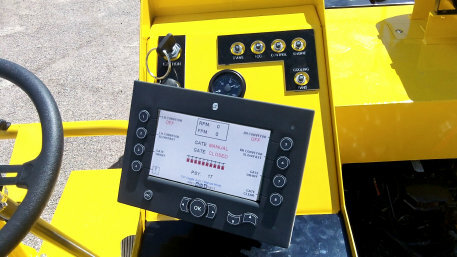 Display can be positioned for operator's comfort while chipping. 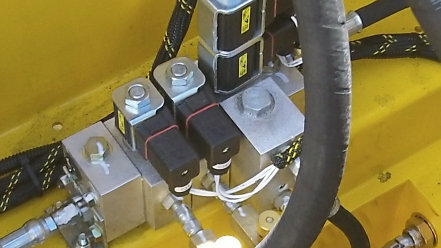 Small compact hydraulic valves allows for fewer hydraulic hoses and more efficient operation of hopper functions. 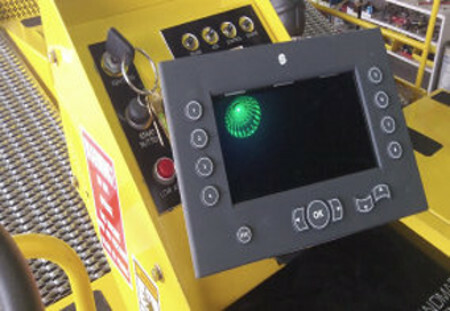 Expandable hopper with all gates in position and giving operator control from 9.75 inches to 17 foot 6 inches with the touch of a button. 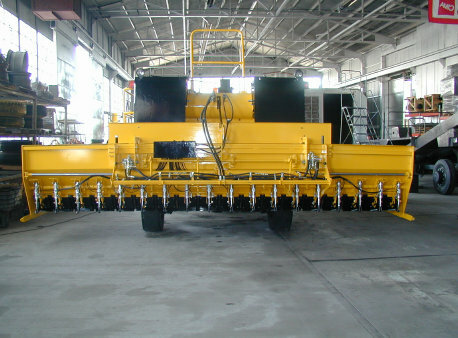 Extension wings are expanded via hydraulic cylinders and gate necessary are added to give operator his desired width. Auger & agitator are driven via roller chain and sprockets via a hydraulic motor. The agitator can be disabled by removing two (2) bolts on the free wheel sprocket. 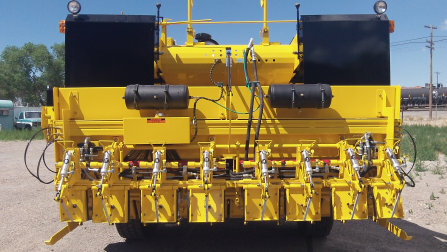 Retrofitting your chip spreader with more versatile hopper and rate and gate control can give you more versatility in your chip spreading. Our expandable hoppers chip seal road in the tall forests. We chip seal along the lake fronts of the world. 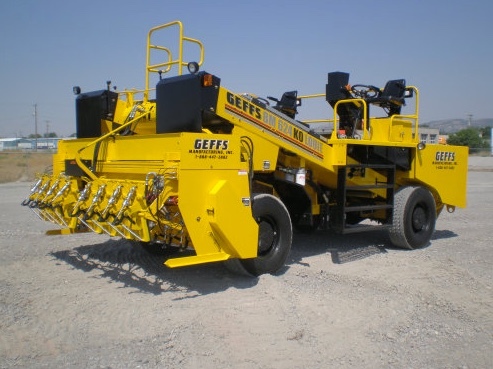 GEFFS Manufacturing, Inc. Expandable Hopper with Rate & Gate Control giving you versatility in your chip spreading. Call 888-447-2882 for current pricing.